Pressurized lift for instant height adjustment. Seat and back tilt adjustment for personalized fit. Choice of fabrics or surgical vinyls in many colors. Durable swivel 5-star base. 24" base is standard. 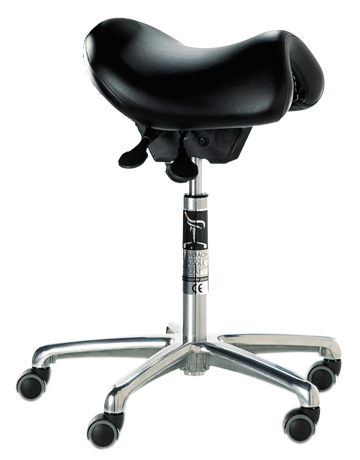 27" base is provided with tall lifts used with a footring for greater stability at no additional charge. Oversize 60mm hooded casters for smooth rolling on carpet or hard floors. Optional braking, locking, and industial casters also available. Meets California TB 117 flammability standards. It is the most comfortable seat I have ever used. on 10/25/2010 I can work long hours in comfort. In the late 1990s I was having trouble with my left gluteus maximus (buttocks muscle) in spasm from sitting too long at my desk. Someone suggested your Bambach saddle seat. I bought one in 2000 and it solved the problem. After ten years of constant use the chair is still as good as new and I can work long hours in comfort. 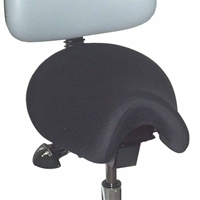 Over the past three years I have been recommending the 'Saddle Seat' to patients attending my clinic suffering back pain. The 'Saddle Seat' is the most effective remedy to this problem I have encountered. No more back pain or aching legs at the end of a long day. 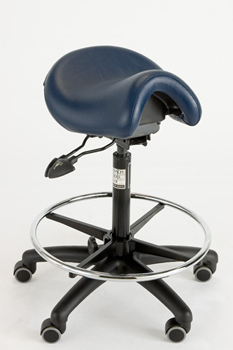 Mobility, adjustment and comfort make this the ideal chair for veterinarians. 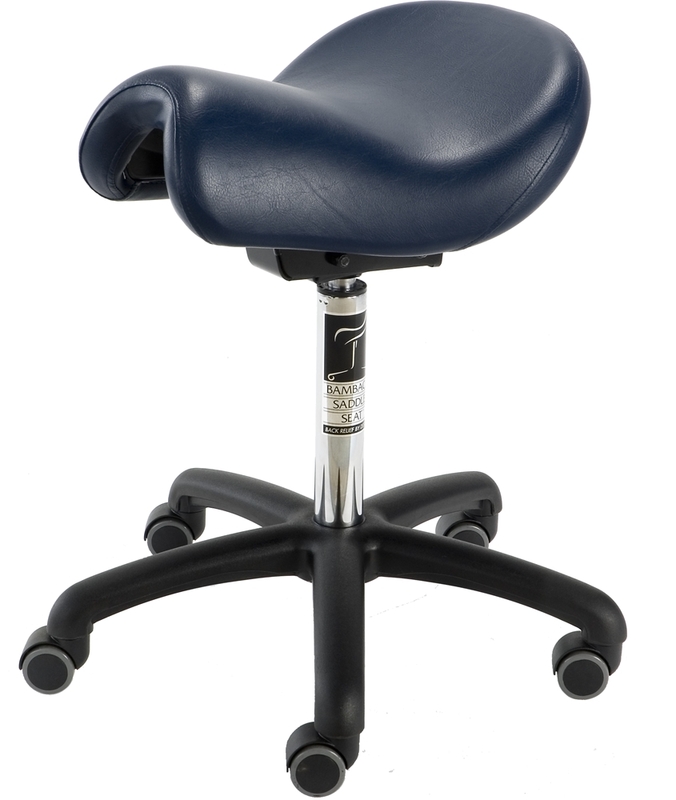 I love my Bambach Saddle Seat and know you'll love yours too. The Saddle Seat works very well for me when I am painting. No longer do I have to raise the easel up and down as the seat has a great range of height control. Our Bambach Saddle Seat upholstery fabric selections are based upon quality and performance. All fabrics are commercial quality and certified to meet California's stringent flammability requirements. Fabric and color availability may vary in different countries and from various dealers. Not all colors are available for all products. For current color availability in the USA, please view the color choices offered in the "Buy" menu for each individual product. 100% polyurethane synthetic leather fabric. Soft, durable, and breathable with superior abrasion resistance. Surpasses 1,000,000 double rubs (Wyzenbeek). Commercial quality 100% vinyl upholstery. Resistant to scuffs and scrapes. Meets GSA upholstery requirements for tear strength with 1.500,000 double rubs abrasion resistance. In stock chairs ships in 3 - 10 business days from our USA warehouse.